This KwaZulu-Natal safari lodge in South Africa is a haven of sophistication surrounded by the wild terrain and stunning African beauty of the Nambiti Private Game Reserve. This luxury Nambiti Hills Private Game Lodge has intimate and luxurious safari accommodation in a spectacular Big 5 game reserve, perfect for those seeking both privacy and romance. 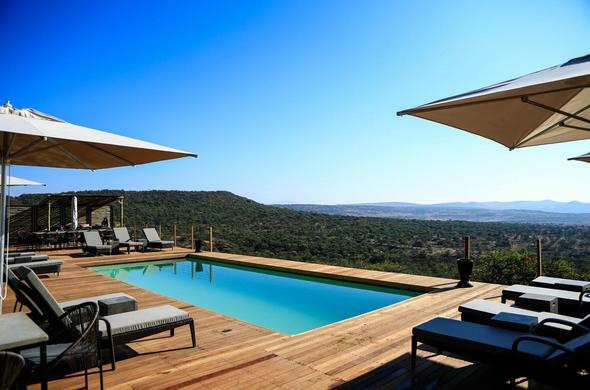 Ideal for private getaways for the discerning, this KwaZulu-Natal safari lodge in South Africa has a unique combination of wide open spaces and discreet intimate places. Its lofty glass-enclosed dining and lounge areas afford panoramic views of rolling hills and savanna by day, and incredible starry skies by night. A wide veranda and bar spill out onto a waterfall and rock pool where guests can float on cushions and sip exotic cocktails. Enjoy delicious breakfasts on the deck and gourmet meals with an open view of the chefs at work in the main lodge.